It’s been a week since I watched The Book Thief, but the face of Geoffrey Rush still creeps into my mind every now and then. We were talking about famous faces on a previous post. A good actor draws you right into his character without distractions from his previous roles, and here’s a good example. 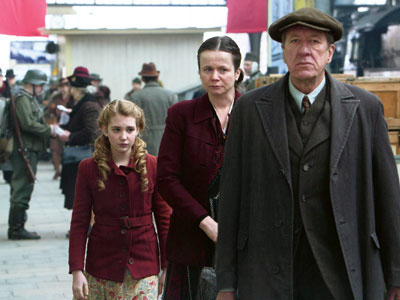 Regardless of Rush’s successful roles in the past, here in The Book Thief, I only see Hans, the nondescript yet loving step-father to Liesel. The movie is an adaptation of the popular 2005 YA novel of the same name by Markus Zusak. The book had appeared on the New York Times Bestseller list for 375 weeks. It had since been translated into more than forty languages. Congruent with the age target of the book, this is an appropriate adaptation. It is a PG movie, so we won’t see the violence and horror as intense and explicit as in Schindler’s List. Before anyone jumps to shoot it down as a ‘sanitized’ version of the Holocaust, let me just say it pertains to the spirit of the novel in quietly depicting life in a small German town under the pressure of Nazi warmongering. It shows a side of the usual WWII movies we seldom see, the ordinary German folks. Zooming in on a street in a small town, it shows the effects of a fierce political regime have on its grass-root citizens: husbands and wives, children, friends, neighbors and acquaintances like the neighborhood tailor or accountant, some of whom suddenly taken away and labelled as the Enemy: Jews. The focus of the story is on the humanity. No doubt, the majority of the town folks are swayed by and immersed in Nazi ideology, yet there are still a few who stand silently against the ferocious regime, but can do nothing. Even a feeble voice of dissent will send them to conscription regardless of age. That’s what happens to Hans. As in the book, we have Death as the voice-over narrator, quietly looming over the fictional town Molching, busy at work. Liesel (Sophie Nélisse) arriving at her new home to her adopted parents on Heaven Street. Yes, ironic, since her little brother has died during the trip. The girl soon finds her new home a comfort, and makes a new friend with Rudy (Nico Liersch) next door. Her step-mother is Rosa, played by Emily Watson who reprises her role as in The War Horse as the seemingly tough and bossy wife and overseer of the home. Her husband is Hans, played by Geoffrey Rush with affective charisma, who shows himself from the beginning that he is the emotion powerhouse, the engine that runs the movie. Directed by Brian Percival (who helms episodes of Downton Abbey), the movie is unabashedly explicit in its emotional channeling. By that, I don’t mean it’s overtly sentimental and melodramatic. The fine line that separates the two may be the word ‘restraint’. Rush and Watson have depicted this quality memorably. He may look oblivious in appearance, but is ever wise and compassionate in spirit; she conversely holds a feisty facade only to hide a tender and caring heart. It is a delight watching them relate to each other. For a YA novel turned into film, the spotlight has to be on the young protagonist Liesel. Sophie Nélisse is a precocious rising star who has won a Genie in the acclaimed French Canadian film Monsieur Lazhar (2011). She has already won a Spotlight Award at the Hollywood Film Festival for The Book Thief. Nico Liersch playing Rudy looks to be a few years too young, but being a good actor, the two loyal friends ultimately shine through as the movie picks up its momentum. The plot line of hiding the Jewish young man Max, son of Han’s wartime comrade to whom he owes his life, adds texture to the story. Max inspires Liesel to love words even more, igniting that spark in her later to write down her story. To Max, the hiding place is more than a shelter from the storm. It is his connection to the decency and dignity of being human. The snowball fight in his hideout in the basement is one of my favorite scenes. As for books, reading, and words, looks like they just work as a cover, in both the book and the movie. That Liesel comes as an illiterate ten year-old in Germany may not be quite plausible. The few episodes where she steals a book are incidental, lacking potent effects. The movie nevertheless is persuasive in its subtle way by turning mere book characters into flesh and blood human beings. The Book Thief is about humans. It shows their ugly face that haunts even Death, and their triumphant side that makes Death envious, the power to love, to hope, and to live despite tragedy and loss. I need to see this film! But must read the book first (I hate to see a film before reading the book, don’t you?). I read it before the movie. But I think it is good enough to stand on its own, thanks to the cast. Yes, I usually like to read the book first before watching the adaptation. That’s why I have all those lists. Click on the ‘Related’ links at the bottom of the post to see a few. I tend not to read your reviews until I’ve seen the film, but as I’ve read this book and seen the trailers I decided to pop in now. I’m looking forward to seeing it, though from the trailers, am not surprised by your assessment that it’s not great but enjoyable. It would be hard for it not to be enjoyable with that cast and that book I think. It sounds as though the director, and the actors, has got the relationship of the two adults down very well. Yes, the two veterans show their skills superbly, definitely a learning experience for the young one in the film. And I’m afraid you can see the contrast. Nevertheless, I have to admit one thing and that is, I seldom, I mean, rarely, have a moist eye while watching movies. But this one, for some inexplicable reasons (inexplicable because it’s nothing that I haven’t seen before, and expected outcomes, since I’ve read the book), brought me to tears. Thanks for the review–Geoffrey Rush caught my eye, but I stayed to read it! Geoffrey Rush is a talented actor. Very distinctive face, but you do forget his other roles and believe the character he’s portraying at that time. Haven’t seen this or read the book, despite hearing so much about it. Thanks to this review I may finally check it out! Terrific review, Arti. I think you thoughtfully captured both the spirit and the nuance of the film adaptation. I suspect I enjoyed it more having read the truly remarkable novel FIRST and would suggest for others to do the same. Thanks for sharing your take on it. I’m so glad they did the movie right. I really enjoyed the book and was worried the film would be too much. Glad they kept Death too. Yes they did. And it’s worth a viewing. I admit I’m not as enthused about the book as many others, but the film exerts more affective power on me, mainly I think due to the visualizing of the book characters through these fine actors. I’m so glad you reminded me about this movie. I loved this book, and I often miss movies like this. I love Geoffery Rush and Emily Watson, so I can’t wait to watch. You’ll enjoy this one. Hope you can see it with your family in Scotland. Thanks for this wonderful review. This is one I have been wanting to see.– but I think I would watch Geoffrey Rush read the phone book. Your thoughts are tremendously insightful and make me want to see this all the more. I think you will love this one. Hope it will screen in your area soon, if not already is. You’re welcome to come back and share your thoughts. I’ve read that some felt having Death as narrator was heavy-handed and weird. Roomie liked your review very well and appreciates your mention of its PG status (she gets nightmares very easily). I’m so glad to read your review of this, Arti. It supports another review I read, which came to many of the same conclusions. And I’m glad for the reminder of Geoffrey Rush’s previous role. Not following film quite as closely as I should, I often enjoy and remember films without having a clue who played various roles! I love Death as the narrator, and I especially like the thought of poor Death being envious of human experience. Metaphorically speaking, I often think of Death being pure emptiness, so it makes sense that he’d envy those who have lives filled with the richness of relationship and feeling. I don’t know if the film has been or is coming, but the good news is that there’s a book out there, too! And I’m glad to know of the PG rating. I’m tired of violence. One I’m going to try to see toward the end of the week is “Philomena”, with Judi Dench. Have you seen it, or read anything about it? So now my computer is up with a new HD. It has been a crashing week. How we depend on technology and will completely lose our bearings when our laptop, cell phone, tablet, etc. are down. Anyway, I’m glad you still come by and throw in your two pebbles. Yes, I’ve seen Philomena, thinking about how to write the review… still in my mind… all these thoughts. I see you’ve become almost, an avid movie goer now. Lots of good films in this award season. But first, I need to dwell on the Advent Season. I actually managed to see the film – Philomena. I sent you an email rather than musing about it here. I’ll save that for whenever you get your review done. I will say I’m glad to have seen it – and I was interested to see how one aspect of Philomena’s struggle was, shall we say, familiar. Now, it’s The Book Thief, if I can get it tucked into the schedule before it leaves. It is playing right now, but I don’t know if it will be here this weekend. I just read film reviews on my friend’s blog – she reviewed Philomena and the Dallas Buyer’s Club – you may wish to read her reviews – http://sitteninthehills64.blogspot.com/ . She lives in Hollywood and was an actress – the Academy sends her the Oscar movie nominations to review. Anyway I looked and both these movies are playing nearby. Twelve Years a Slave and The Book Thief are playing at the same theatre – I don’t know how many movies we can see in one day – we’ll see. I’d like to see Twelve Years a Slave because I did enjoy the book. The last movie I saw was Blue Jasmine last August, so it is time. A month or so ago we wished to go but all the theatres around here were showing mostly children and teenager films. Now of course all the Christmas movies are coming up. Thanks for the link. I’ll definitely check it out. It’s that time of the year we all call Award Season. So we’re getting some high calibre productions. The Book Thief, I’m afraid, will not be regarded as one of those, but as I mentioned, it is still enjoyable with the talented cast. I thought the film was awesome ;). Great acting from the child actors. Hard hitting and emotionally pumped. I went home and wrote a poem/lyrics whilst the power of words was still in my mind. The Guardian newspaper in the UK gave it a couple of poor reviews. I have a couple of compositions to do this year so if I get around to this one I’ll share it ;). Your reply didn’t show up in my notifications, I think wordpress have had a change around recently.